Retaining walls can be constructed with a variety of building techniques and with different materials such as steel, timber, or reinforced soil. Here, we will focus on rigid, monolithic, poured concrete walls that are constructed from the bottom up, where a stable backslope exists (at least temporarily) prior to wall construction. With poured concrete retaining walls, backfill is placed between the wall and the slope after the wall is constructed. In this section, we will talk about the walls themselves, their design and some important construction considerations, but not about groundwork or compaction, since these are entire topics in their own right. Designers and builders of any kind of retaining wall should be familiar with and follow the procedures and methods for soil preparation and backfill compaction as dictated by the appropriate local building codes. In most states, retaining wall designs taller than about four feet must be designed by or approved by a qualified, licensed professional engineer. Additionally, it is important to check with and adhere to local building codes prior to any construction, even when walls are shorter than four feet. 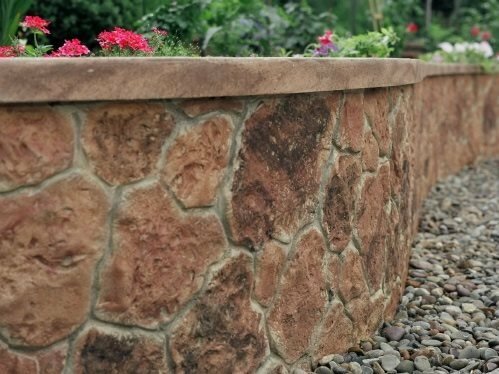 Retaining walls are, and should always be viewed as load-bearing members first, and aesthetic groundscapes second. Ground water conditions and soil characteristics. Other factors can include skilled labor and material availability, building codes, site accessibility, aesthetics, local building practice, etc. 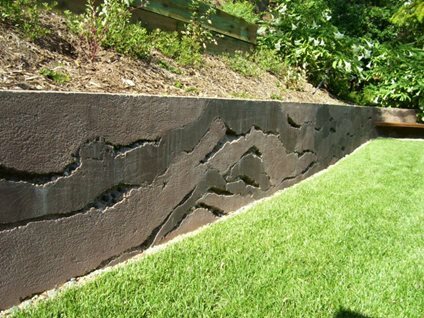 Poured concrete retaining walls can also be decorative and reproduce the look of stone or masonry. In this photo, Increte contractors installed a poured-in-place decorative concrete wall system called Stone-Crete that creates deep relief stone walls with a variety of available textures and colors. 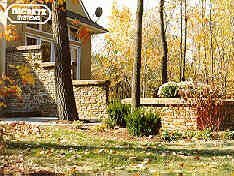 Stone-Crete is used for sound barrier walls, retaining walls, subdivision entry walls or wherever a beautiful deep relief stone wall is desired. Stone-Crete's mass production techniques minimize costly masonry work while providing the structural and aesthetic quality of concrete. Many other manufacturers make form liners and the stains for coloring the poured concrete walls. 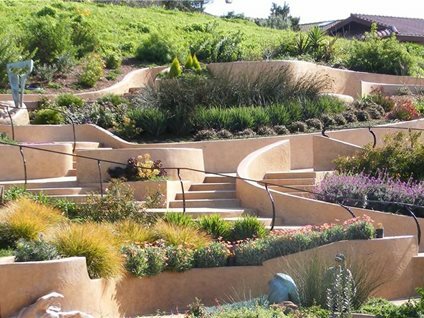 Tom Ralston Concrete used cast concrete walls to transform this hillside into a beautiful and usable space. These walls were designed to have sweeping curves and integral lighting. The surface of the walls was hard troweled and colored with an Alcantar Nutmeg Color hardener to create a variegated look. To preserve the structural integrity and decorative finish, a cementitious waterproofing was installed to back of the wall where it contacts dirt. This wall, created by Ron Odell's Custom Concrete, is over one hundred feet in length, more than a foot wide and took three truckloads of concrete to pour. To achieve the layered look light gray concrete was poured in the bottom of the forms and then sprinkled with rocks and other natural debris which was followed with dark gray concrete. This process was repeated until the forms were completely filled. A forty foot grade made retaining walls necessary for this property. Victor Amador, of Soft Concrete, formed the walls himself and poured them in place. He approached the walls from the mindset of a sculptor, creating pleasing curves and even pockets that serve as planters. The walls were textured with an Italian slate stamp and painted to match the house. The low retaining wall surrounding this patio is far from ordinary. Hundreds of rocks and stones found on site, as well as local seashells, were embedded randomly to enhance the freeform organic design. Portions of the wall were polished, while the areas with protruding stones were left alone. The top of the wall features a ribbon of glass aggregates.